Facebook, Twitter, SnapChat, Instagram - the evolution of social media has had a profound impact on how we connect with each other, and how we connect with brands. In this dynamic space Beca Alexander founded Socialyte, one of the world's leading influencer casting and social media agencies, creating campaigns that have reached over 130 million people worldwide. We sat down with Beca to gain insight into social influence, how it has impacted the fashion and beauty world, and where she thinks it is headed. [This has emerged] from a need for relatability, a way to connect with others who are similar to you. LM: How did you get started, and when did you recognize the opportunity within the influencer space? B.A: I started as a ‘blogger’ myself, building one of NYC’s first fashion blogs. We reached our peak at about 5M monthly readers and a team of 50+ writers, and contributors, globally. This was before the rise of personal style, so our content focused on industry news, and insider info, instead of ourselves. And this was better as the dollars started shifting into social and digital. One day, we received an offer to sell. At the time, I had a job offer in front of me from my dream company. About a year later, personal style bloggers started getting recognition from brands, and I had a few friends coming to me for advice on how to work with brands, and brands coming to me asking about my knowledge of the blogging space. I thought to myself, if brands want bloggers and bloggers want brands, how can I bridge that gap given my experience. It first started as a side hustle after hours and on weekends, and after a few months, became my full time gig. Here we are, 8 years later, with a team of almost 30, 50 represented talent, and hundreds of brand clients. L.M: What is your point-of-view on the shift in the fashion and beauty space, in terms of how brands connect with their audience? B.A: All of this started with MySpace and the rise of social platforms, which gave way to digital content creation that was public facing. There was a platform called Lookbook.nu that revolutionized the sharing of daily outfit images where followers could comment and engage with a community of millennials that were ‘just like them’. The rise of influencers really came from a need for relatability, a way to connect with others that are similar to you. The opposite of the unattainable celebrity culture that we all grew up in. Influencers wore clothes that were affordable and bought from places that we all already shopped at. It was almost like they were our friends just from afar. Of course this lead to public facing journals, called blogs, which eventually lead to FB, Twitter, YouTube, Instagram, Snapchat, Vine, and all the other platforms on which content is shared and consumed. L.M: Can you tell us a bit more about Socialyte, and the type of projects you work on? 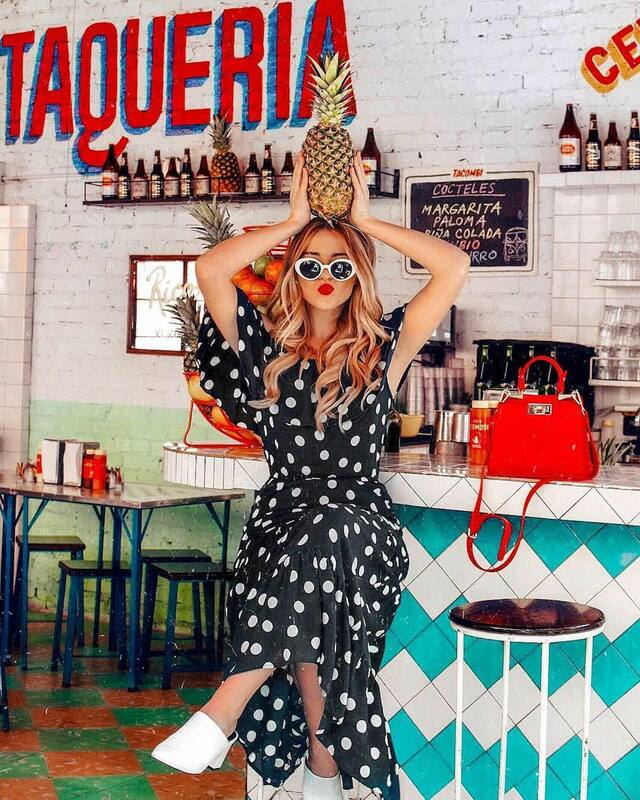 B.A: We work with fashion, beauty, and lifestyle brands to help plan a 360 strategy that is about targeting and reaching the right consumer, vs picking the right influencer/s. Brands have to shift the way they look at content creators, as not all are a fit for their needs. We educate brands and the various ways you can use influencers to generate ROI. Then we cast and activate talent for those specific needs. For example, when working with spirits brands, you have to consider not only the age of the talent, but the age of the majority of their readers. Or, understand that not all mom influencers have a following of women who have children. All programs are customized based on the needs of that specific brand, project, or service in order to drive the best possible return on ad spend (RoAS). Image: Cremedemichelle for Big Star Denim. LM: In what ways are brands working with talent, and how has this evolved since Socialyte was established? B.A: The first campaign I negotiated between a talent and a brand was $50. The next was $100, then $500, then $1000. But this took almost a year. Now, we’re seeing programs come in at a few hundred thousand dollars for one talent. And brands spending upwards of a million a year with Socialyte on ‘always on’ programs. Besides the dollars, the space has become oversaturated with content creators who are all starting to look and feel similar. Eight years ago, there were 10 known talents, then 10 turned into 50, and 50 turned into 500. Now, we have a network of thousands of content creators across many categories and platforms, across cities and states and countries. We can cast talent for any brand, any program. Another major shift has been related to numbers and analytics. A few years ago, the amount of people who followed you was the currency, and brands were paying $ based on that following. There was no transparency on who those followers were. Now, not only do we have data on exactly who they are, where they are, what they engage with and what they buy, we know that influencers only reach a small portion of their actual followers, so targeting is key when activating talent. LM: The digital / social space is so dynamic, where do you see the industry moving over the next few years? B.A: Instagram will keep evolving and launching new features. Their foray into longer format video content will be interesting, as it may fully disrupt YouTube. Content creators on Instagram who have nothing original to say will continue to be de-prioritized, as their follower growth slows and they slowly lose the ability to engage their audience. More unique voices will continue to dominate and gain market share. Niche content categories will be more important for brands versus wider reach. The pricing structure for the top tier influencers will change as more brands recognize that the ROI isn’t there for the amount of money spent. Brands will continue to look for other forms to reach a target market, including more dollars being shifted towards ad buys using influencer created content. Podcasts will become more important for brands to pay attention to as a way to market to that specific audience. Twitch, and other category specific platforms will play a larger role in our business, as gaming becomes a bigger category for us. Note: Additional image by @tezzamb for M Missoni.